Please note – This post contains affiliate links. This means any purchases from these links are from amazon. I will receive a small commission but this is at no extra cost to you and supports my blog. Most kids find messy play impossible to resist. If you really can’t stand the thought of messy play in your house, do it in the garden or bathroom. Keep an eye out for local playgroups or even messy play groups. This way the kids get to enjoy it but you don’t have to clean up. Some kids will need a bit more encouragement and may need a bit of time before they want to get stuck in. Some are more sensitive than others and some won’t like touching new things that feel odd. Others will dive right in (literally). I strongly advise you get a messy play mat / table cloth or tray. It will get messy so if the mess can be contained it helps. Also, your children will see the mat and associate it with messy play. Then they get excited before you even start. With very little ones it can be useful to keep them in a highchair for very messy activities. Having said that children seem to have an amazing ability to splatter anything messy across the room. Be prepared with baby wipes and don’t wear your favourite top. We bought a plastic cement tray online which has been great for messy play. They are large so we have to keep ours in the shed. My eldest son has autism and messy play has been a fantastic way to engage with him. When you introduce something fun to kids it is a great opportunity for you to play with them. Messy play needs supervision if you don’t want paint all over your walls or your children eating shaving foam. If you are already supervising you may as well get involved too. If your child won’t tolerate you playing with them then play alongside them. Hopefully they will join you if you are doing something exciting. This is always a winner in our house and there are so many options. It is usually easier to strip your kids down to nappies / pants when they are going to get soaked. If you are going outside in the cold stick on the waterproofs and wellies. Washing up – Kids love to copy things they see every day. If you have plastic plates and cups they love washing them up. Toys get really dirty and every now and then I give the kids a bucket of water and washing up liquid (the more bubbles the better) and a pile of dirty toys for them to wash, they love it. Painting the wall – on a nice day give your child a bucket of water and a large outdoor paintbrush. Then let them ‘paint’ the outside wall, fence or door. Spray bottle – you can get these in most supermarkets or garden centres. Let your child spray the outside windows or walls. Or they can spray the plants and trees in the garden or even spray you if it’s a hot day! It may be difficult for little ones to do the squeeze action but my 3 year old loves it. Pouring water – this is a very simple life skill but one that needs a bit of practice. Give your little ones some water with plastic cups, jugs, buckets, watering cans, funnels and they will have hours of fun. Let them play in the bath every day before bed and don’t forget the paddling pool on a hot day. If you want to get more creative try a water wall. Water walls – A friend of mine helped me create a little water wall in the garden. There are loads of examples online. You can use any old bits of pipe, guttering, trellis, funnels etc. Your kids will love to help set it up. When its ready give them a jug or cup of water and they can pour it and watch the water run through. Puddles – My kids seem to be obsessed with puddles and can’t pass one without jumping in it! If it is a hot day make your own puddles. If it is raining get your waterproofs on and go puddle jumping. Muddy puddles seem to be the most popular. You can also add powder paint to puddles if you want to add a splash of colour. The Hose – Give your kids the garden hose and they will love you. You will get drenched and this is why its Daddy’s job in our house. My son loves to wash the car with the hose. Let them loose in the garden and you may end up with a bog but you will have happy kids. We got an old piece of guttering and set up a run across the garden. They use it to wash toy boats along using the hose. My husband likes to use the hose on our toy slide. I tend to hide when this is going on as I can’t watch my kids at high speed flying down the slide. Ice – A really simple one but great for teaching about temperature. I love to use jelly or cake moulds to freeze different shapes. It can be fun to add some juice or food colouring to the water before it so you get coloured ice. You could start with some ice cubes and see if you can build a tower before it starts to melt. Obviously the best place to play with sand is at the beach but I don’t have one nearby so we have invested in a sandpit. If you are in the UK then a lid is essential. Many child orientated attractions have sandpits or even some shopping centres so find out where your local one is as your kids will love it. Sandcastles – every kid needs a bucket and spade set. Thankfully you can pick them up cheaply at the pound shop or local supermarket. Sandcastles are a must, it took my son a little while to get the process but once he did he was off. Most kids love to knock them down. Coloured sand – you can buy coloured sand or colour it yourself. It is great for making cards and doing art and craft activities. Kinetic sand – this is very popular at the moment. You can mould the sand and it will stay together in the shape. So far I’ve had mixed results with kinetic sand but it is well worth a try. Treasure hunt – bury your child’s toys (e.g. little dinosaurs) and get them to dig them up in the sand. My boys love getting muddy. Get outside, in the garden, woods or local park, you will find plenty of mud. You can also get cheap bags of compost in the supermarket which makes for hours of fun. Gardening – get your kids to help you in the garden. They will love planting seeds in pots or planting flowers. Strawberries and sunflowers are good ones where you should get results quickly. But for those that can’t wait cress and herbs will grow very quickly. Digging – Some children benefit from doing heavy work as they have tons of energy to use up. Digging and moving soil in a wheelbarrow is a good game. Trucks – My son has a toy truck and he loves filling it with mud and transporting it round the garden to a new mud pile. Mud kitchen – there are some amazing examples of mud kitchens online. We got a second hand toy kitchen for the garden and the kids can now make mud pies whenever they like. Old pots and pans are great garden toys. 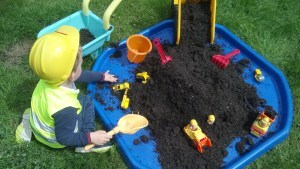 Diggers and toys – I love to get some cheap compost and put it out for my boys to play with. They can use toy diggers, cranes, bucket and spade. This is one I try to do at the table or in the garden as I do not want paint all over my furniture. Having said that if you buy washable paint it does come off very easily. Pinterest – to be honest I am not very good at art and craft but I have found loads of easy ideas on Pinterest. I find it great to look through for new ideas to try. Painting – this is great fun and you can use lots of different colours and try mixing new ones. Foam shapes are great for printing or you can buy stamps. Small children can get very messy-a good option when starting out is roller paints. Mess free painting – technically not messy play but for those days when you need your child not to be covered in paint. Take a small piece of card that will fit in a plastic sandwich bag. Squeeze some blobs of paint onto it. Then carefully place it inside the bag (trying not to squash the paint blobs). Now use sellotape or parcel tape to seal all four edges of the sandwich bag. Give it to your child and they can squash the blobs of paint and use their hands to move the paint around. Making Cards – get some card and whenever you are doing arts and crafts let them loose with paint, glue and glitter. It is always handy to have some homemade cards on hand for grandparents or teachers. In my experience if you try and get them to be creative for a card you need the next day that will be the one time they don’t want to do it. Seasonal themes – Easter, Christmas, Father’s day, bonfire night there is always an occasion or season that you can use as a theme for arts and crafts. At Easter we used paper plates and cotton wool to make a sheep, the internet is full of ideas and templates to help out those of us who are not naturally creative. 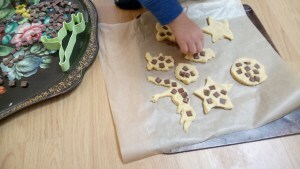 Playdoh – actually it isn’t too messy, you can use biscuit cutter sets on playdoh and it is great for working on shapes and colours with your kids. There are lots of playdoh kits out there and you can easily pick them up second hand. Hand, foot and finger painting – getting your kids to do hand prints and footprints can make great gifts, you can also get them to do finger painting as an alternative to paintbrushes. Welly painting – my boys really enjoyed this, we got a long piece of paper (you can just tape some together) and a tray of paint, the boys put on their wellies jumped in the paint then went walking (or running) up and down the paper. You always have things at the back of the cupboard that can be pulled out for messy play. When you are at the supermarket keep an eye on reduced items as many will be great for playing with. Cornflour – this is one of my favourite activities. Mix 450g of cornflour with 475ml water, keep mixing until it is a thick consistency. You can use more or less water and try out different consistencies. Give it to the kids on a tray with bowls, spoons and cups so they can mix it, run it through their hands and drizzle it all over the tray. It is fantastic to play with as it pours like a liquid but also acts like a solid. The best bit is although it is very messy at first as it dries it becomes very easy to clean up and doesn’t stain. My eldest will play with it for ages. Cereal / Porridge – if you have a box of cereal that is going to waste or porridge use it for messy play, use it as the base then add in some toys for the kids to play with. Herbs and spices – Every now and then I tidy my cupboards and find lots of out of date herbs and spices! Instead of putting them straight in the bin let the kids play with them. Get them to smell them, look at the different textures and colours. The containers are great fun for shaking out the contents into a big bowl. Rice and pasta – If you have some dried rice or pasta this can be fun to play with, you can glue it into pictures or simply practice picking it up in a spoon and putting it in bowls. Cooked pasta – You can cook pasta then add some food colouring once it is cooked, then add some vegetable or olive oil so it doesn’t stick together. Once it is cool you can let the kids play with it. Some people use shaving foam but since I found mouldable soap foam this is my favourite as it doesn’t really leave a mess. You can simply get some foam between your hands and clap over your child to create a snow effect then let them stamp on it. Ice cream splat – get an ice cream cone and fill it with the foam, let your kids then splat the ‘ice cream’ onto a tray. It is over quickly but a good attention and interactive game. Christmas scene – if you have some Christmas themed toys you can set them up with a foam (snow) base. Children are never too young to start cooking and preparing food, start small like spreading butter you will be surprised how much they enjoy it. Try to make it fun and hopefully they will also enjoy eating it. Rice crispy / cornflake cakes – these are so easy to make and most children will love licking the spoon from the melted chocolate. Muffin pizza – slice a muffin in half, get the child to spread on some tomato base then cover with grated cheese and other toppings they like. Make a sandwich – keep it simple let them make their own lunch with a little help. The pound shop is a great place to stock up on messy play supplies as is your local supermarket. 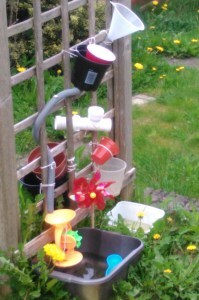 Facebook, Gumtree and Freecycle/Freegle are great places to get second hand garden toys, old bits of guttering / pipes and lots more cheap or for free. Jade is a full time mum to her 2 boys aged 4 & 2. 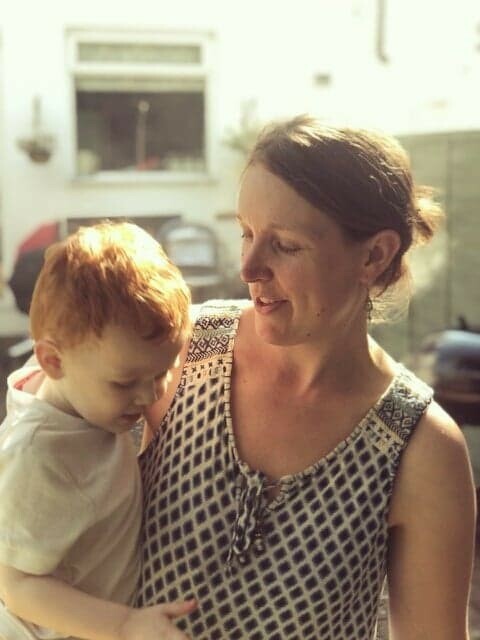 After her eldest son was diagnosed with autism she began blogging at AboutASD to share information and resources about autism. Jade lives with her husband and boys in the West Country, between Bristol and Bath. Before having kids Jade worked in Strategy and Information so has a passion for sharing information and being helpful. Follow About ASD on Twitter and Facebook.